The State of Israel practices racism and discrimination in its laws towards the Arab population since before imposing the racist marriage law which was passed by the Parliament on the 13 July 2003. The Israeli Parliament voted to block Palestinians who marry Israelis from becoming Israeli citizens or residents, erecting a new legal barrier as Israel finished the first section of a new physical barrier against Palestinians West Bank. After occupying the West Bank and Gaza Strip in the Six-Day War of 1967, Israel began permitting Israelis who married residents of the territories to apply for their spouses in Israel under a program of family unification. Since signing the Oslo agreement, Israel began restricted the program of family unification, they even restricted the family permits for staying in Israel. Furthermore, the Interior Ministry of Israel confiscated hundreds of Israeli citizenship IDs from Israeli Arabs from the East of Jerusalem. Administration in Hebron. 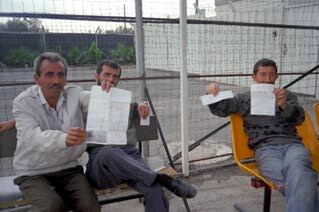 They have applied for permits to stay in Israel, for which they have applied. They will probably be asked to collaborate with the occupation. On July 2002, after the occupation threw me out of my house in Hebron, and while I was denied by the Israeli government the right of traveling to Austria, and throughout my illegal staying in Jafa, I demonstrated in the center of Tel Aviv with Gush Shalom and the Ta'ayush Arab-Israeli peace movement against the racist discrimination law which was imposed by the Israeli government against the Arab population. The racist law which was imposed by the government was preventing Arabs from building houses or to buy land near the area of the Jewish settlements which build in the middle of their cities and villages in what is called Israel. The tensions have been growing between Israel's Jewish and Arabs populations since before the Intifada broke out on 29 September 2000. Actually, the State of Israel practiced the racist marriage law even during the Peace time before officially imposing it. The Israeli-Arab citizens who married Palestinians were issued by the Civil administration of the Israeli Army a staying permit in Israel for not more than six months. Even in such cases the Israeli civil administration did not grant a permit for these people, and they were denied the right to live normally with their families in Israel. In cases which I investigated and published in the media, the husbands were divorced, and the children have to pay the taxes for the Israeli racism. The civilized State offered some of these Palestinians who were married with Israeli-Arabs who needed a staying permit, to spy for Israel as a condition for granting them the staying permit. The people who refused the Israeli offer of spying, were not granted a staying permit in Israel with their families, and they had to get divorced. entering this area after these pictures. The Israeli-Arabs have been used by the Israeli Parliament members as mediators between them and the Israeli Interior Ministry to grant a staying permit. 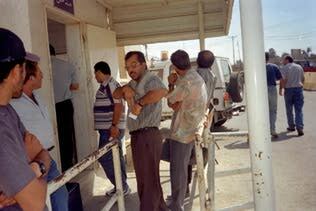 After the Intifada broke out the situation become more complicated. In 2001, three Israeli Parliament members mediated between the Interior Ministry and an Israeli-Arab who was was engaged to a Palestinian woman from the West Bank. After three months, the bride, Iman, was granted a permit for 24 hour for staying in Israel with her new husband. Mrs. Ochrochya Al-Tayeb, an Israeli Arab from Jafa has been married to a Palestinian man from Gaza sssssince a couple of years. Last year, during 2002, she visited her family with her child, but she was prevented from returning to Gaza. The child suffered deep psychological pain. The mother asked everyone if they could help her to return home in Gaza or grant her husband a staying permit in Israel. The last mediator was the Parliament member Ilan Shalge from Shinui party, but her petitions were refused every the time, and her petitions are being blocked by the Israeli interior Ministry until now. Ms. Al-Tayeb will probably be forced to a second divorce.